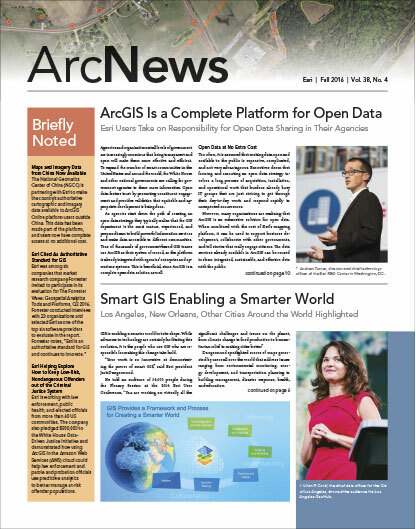 This is an exciting time to be a GIS professional. Every day, thousands of GIS organizations around the world are compiling and building geographic data layers about topics that are critical to their work. In many cases, these layers are being openly shared, providing others with the opportunity to leverage their efforts. The scope this information covers is almost everything—rooms in a building, parcels of land, neighborhoods, local communities, regions, states, nations, and the planet as a whole. With web services and cloud computing, GIS promises to become embedded in almost everything we do. Organizations from myriad industries are picking up this new GIS pattern and deploying it in entirely new ways. GIS continues to be a platform technology for maintaining systems of record and making basic maps. The emerging Web GIS pattern has expanded it to also be a system of engagement that can reach everyone with mapping and the power of spatial analysis. The Web GIS pattern is fundamentally enabling this transformation. Web GIS is also making it easier to connect to and integrate many types of distributed data. Esri users have already been incrementally deploying enhanced technologies available in the Web GIS pattern using ArcGIS Online and Portal for ArcGIS. However, with the 10.5 release of ArcGIS, users will be able to deploy a complete Web GIS (similar to ArcGIS Online) in their own infrastructure. Significant distributed computing enhancements have been made to the ArcGIS for Server technology, and its name has been changed to ArcGIS Enterprise. ArcGIS Enterprise includes everything an organization needs to launch a dedicated Web GIS in its own infrastructure. The software efficiently delivers secure, scalable, data-driven mapping and GIS throughout an organization. ArcGIS Enterprise is much simpler to set up and administer. It furnishes portal-to-portal collaboration, which further enhances information sharing and makes it easy to access authoritative content across departments and agencies. ArcGIS Enterprise is designed for both local infrastructure and native cloud deployments (in Amazon Web Services, Microsoft Azure, and others), giving organizations flexible options to meet their infrastructure needs. The portal collaboration capability in ArcGIS 10.5 enables organizations to easily configure an enterprise system that spans multiple Web GIS implementations. 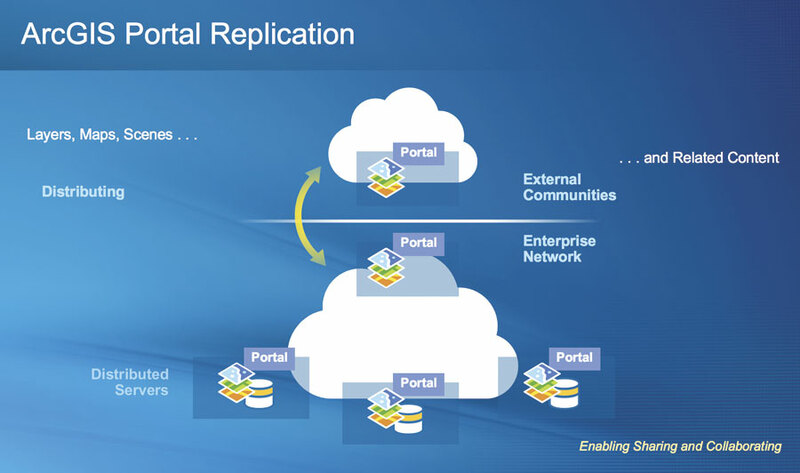 This is done through portal-to-portal and portal-to-ArcGIS Online replication services. Distributed Web GIS helps users organize and share content across departments, organizations, and geographic areas. With portal collaboration, content and items can be shared beyond a single Web GIS implementation. This facilitates enterprise GIS collaboration within a trusted network of participants, as well as beyond the organization with GIS Hub implementations. Insights for ArcGIS is a new web app that works with ArcGIS Enterprise and supports exploration and analysis of spatial data using maps and charts. Data from almost any source is organized in workbooks and cards, where it can be visualized and interacted with to gain better spatial understanding. ArcGIS GeoAnalytics Server makes space and time analysis considerably faster through the power of distributed computing. This includes harnessing the computing power of multiple servers and nodes rather than relying on a single machine. Now, users can analyze and make sense of billions of data points in minutes or hours instead of days. At 10.5, users can employ ArcGIS Image Server to build their own big data raster processing and analytical workflows. ArcGIS Pro is used as a client to manage this work and generate analytic results. ArcGIS GeoEvent Server gives users the ability to connect to and use streaming data from sensors and devices, as well as social media feeds. With GeoEvent Server, organizations can track their most valuable assets on a map in real time. They can monitor assets that constantly change location, such as vehicles, aircraft, or vessels. They can also track stationary resources that collect a variety of constantly changing attributes, such as weather and environmental monitoring stations or utility network sensors. ArcGIS Pro 1.4, which will release around the same time as ArcGIS Enterprise, will complete most of the functionality of ArcMap. This includes geoanalytics and raster analytics tools in the standard interface. These new tools will work like any other geoprocessing tools. With a Web GIS implementation, ArcGIS servers can have their raster analysis and processing powers scaled up so users can create persisted results faster and share them within the organization. In addition, users can share and publish scene layers to an ArcGIS Enterprise portal. Shifting to a Web GIS pattern is enabling users to better connect to the world of information both within their enterprise and outside of it. This is best represented by the ability to integrate real-time information streams from the Internet of Things (IoT). With Web GIS, geospatial information becomes dynamic instead of remaining static. This allows organizations to be more agile, moving from custom application development and configurable templates to using web app builders. Most importantly, Web GIS promotes open data and expands shared services that engage and empower everyone. Web GIS is much more than a trend; it’s the new paradigm for implementing a modern GIS. It is fundamentally changing how we think about GIS and the role of GIS professionals, as well as how they do their work. What Does Your Symphony of Apps Look Like?